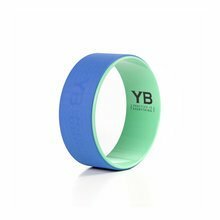 YOGABODY Naturals - Online Store - Nutrition, Props & More! Let's Get Rollin'... join this fun, dynamic yoga class using the Wonder Wheel™ to challenge and deepen your practice. THE WONDER WHEEL™ is a powerful yoga practice tool for backbends, shoulder and upper-back opening, balance training, core strength, inversions and more. 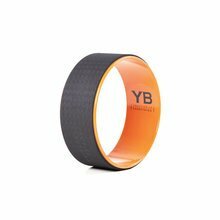 This simple yoga prop can serve as a full-body, functional trainer making it an ideal addition to your yoga practice room or studio. The Wonder Wheel Video - ONLINE PROGRAM with FREE PDF Pose Chart has been added successfully to your wishlist. Let's Get Rollin'... join this fun, dynamic yoga class using the Wonder Wheel™ to challenge and deepen your practice. THE WONDER WHEEL™ is a powerful yoga practice tool for backbends, shoulder and upper-back opening, balance training, core strength, inversions and more. This simple yoga prop can serve as a full-body, functional trainer making it an ideal addition to your yoga practice room or studio. The Wonder Wheel can be used on any hard surface, indoors or outdoors with our without a yoga mat. This video program includes a full-length practice with step-by-step instructions. The practice level is appropriate for beginning and intermediate students, and no previous experience is required. All you need to follow along is a yoga wheel, a yoga mat, and a space to practice. LEVEL: beginning and intermediate, no prior experience required. 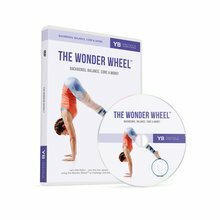 There are currently no reviews for The Wonder Wheel Video - ONLINE PROGRAM with FREE PDF Pose Chart, but you can be the first! 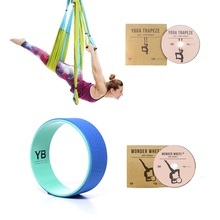 Blue Yoga Trapeze® and Blue Wonder Wheel Bundle View Sale! DVD The Wonder Wheel® Let's Get Rollin'! Level beginning and intermediate View Sale! Jumbo (15") Yoga Wheel™ YOGABODY® – The Wonder Wheel™ – DVD & Pose Chart Included, Orange/Black View Sale! Jumbo (15") Yoga Wheel™ YOGABODY® – The Wonder Wheel™ – DVD & Pose Chart Included, Teal/Blue View Sale!